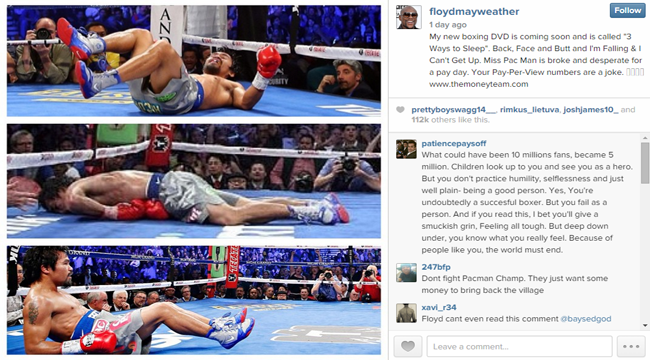 Floyd Mayweather once again taunt Pacquiao with his new trash talk post on his Instagram account. A few days after Floyd Mayweather gave more demands to make the big fight with Manny Pacquiao possible. Instead of fighting in the ring, Mayweather answered Pacquiao’s jeers on un-tattered record of no lose. Pacquiao said that the American’s boxing record is questionable since he is known to be allegedly choosing to fight boxers who are easy to win over for him. The Filipino Icon said that to be called the best, one must fight best. Then three days ago, PacMan Twitted after the rumored that Mayweather’s take on All Access was staged, saying that the show’s authenticity reflects Mayweathers desire to fight him in a mega-fight. Recently, Mayweather added two conditions in his seemengly endless list that he would only fight Pacquiao if his team would manage everything. Now, he once again jabbed PacMan on Instagram with the photo depicting the Filipino Champ that seemed to be lying on his back, side, almost sitting position in the boxing ring. He even put a caption saying that ‘Miss Pac Man’ is now broke and desperate for money.